Aaron Martin may well have played his last game for the club in the weekend victory as he was not included in the squad tonight. It is thought that discussions between Southampton and Eastleigh are ongoing and a deal for the highly rated 19-year-old could be concluded as soon as Thursday as the talented defender looks set to make a dream move to the Saints in the football league. Should a transfer be completed, Martin would follow in the footsteps of the likes of flying wingers Damian Scannell (Southend United) and Mark Marshall (Swindon Town) who also shone in their time at Eastleigh in recent years before progressing to Coca Cola League One sides. Former Salisbury City captain and Newport County commanding centre half Aaron Cook was brought straight into the starting line-up for his Spitfires debut having completed his move to the Silverlake Stadium. Further positive news for the hosts was seeing the name of Jamie Brown back on the team sheet and on the substitute’s bench after a succession of injuries had hampered his start to the season. As the action got underway, Anthony Riviere forced an early save out of Matt Lovett in the second minute. Eastleigh’s Brett Poate whipped in a cross from the right flank soon after, that skimmed off the surface narrowly evading Riviere in the centre as the ball made it’s way through to the keeper. Lively forward Lawrence Yaku showed plenty of promise in the opening stages and pace that could cause a problem or two to the Eastleigh defence throughout the game. With just three minutes played Yaku powered his way through having beaten the offside trap to find himself one in one in front of goal. Jason Matthews raced off his line to meet the striker at the edge of the penalty area; the Eastleigh goalkeeper however, stood up well to the keep the forward’s chipped effort out. Just two minutes later, a high ball forward into the path of Yaku saw the Beaver spot Matthews off his line and attempt a first time shot from distance that was dealt with by the Eastleigh stopper who backpedalled to catch the ball. Again in the 8th minute Yaku continued to be menacing to the Eastleigh defence as he cut in from the right this time to fire a low, left foot drive towards goal to force Matthews into a smart save at his near post. Peter Adeniyi delivered a number of teasing crosses from his right midfield position for the hosts but it was Hampton & Richmond who looked the most dangerous in the final third with a quarter of an hour played. 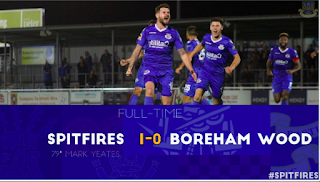 A deep free kick from Brett Poate saw Eastleigh skipper Tom Jordan charge in to meet the ball with a powerful header that flew narrowly over the cross bar and now the game was beginning to throw up chances at either end. An in-swinging corner from Danny Smith on the far side saw Lovett turn the tricky ball in away for a further corner on the near side in quick succession, though the visitors dealt with the second set piece more comfortably. In the 19th minute, Marcello Fernandes’ dipping free kick was dangerously close to opening the scoring and picking out the top left hand corner of goal after Yaku had raced through the centre and being brought down. A minute later, Jordan uncharacteristically missed a header from a long throw which allowed Yaku in down the left flank to square the ball across the face of the six-yard box. Aaron Cook did extremely well to intervene with a crucial sliding interception to clear for a corner as he got to the danger first to clear to safety. From the resulting corner kick, Orlando Jeffrey was agonisingly close to finding away through the Eastleigh rearguard but flicked his effort into the side-netting as Alan Devonshire’s side continued to exert plenty of pressure. John Scarborough’s monstrous long throw wasn’t dealt with by the home side as Eastleigh relied upon an inspired Jason Matthews to keep them in the game once more with a splendid save and excellent use of his legs to deny Craig Dundas from point blank range. Matthews was being worked extra hard and even had to make a stop from his own player as Danny Smith tried to deal with a corner only to header the ball towards his own goal. Matthews had to react in a split second to pull off a top-drawer flying save to spare Smith’s blushes but more importantly keeping his side level as the ball was heading for the back of the net. Midway through the half Tony Taggart showed excellent wing play to cut in from the right before working a teasing delivery into the penalty area. Jeffrey managed to step in but could only slice the ball behind as Taggart’s cross caused momentary panic in the Beavers’ defence. Whilst Hampton looked dangerous on the counter attack, the tireless Richard Gillespie put in another good shift for his side in attack tonight for Eastleigh and it was his ball in-field to Riviere that saw the latter force a corner from a deflected shot. Tom Jordan’s backward header soon after was comfortably wide of the mark from Smith’s high cross. The visitors were awarded a free kick in a great position, 20 yards from goal slightly to the right. Fernandes struck it well enough as the free kick was on target; though Matthews positioned himself well and was safely behind the attempt. The crowd of 550 watched on as both sides created chances only failing to find the cutting edge required for a breakthrough to be made. Gillespie worked a yard of space for a shot as Taggart knocked the ball forwards into attack though the ex-Bashley hotshot could only fire high and wide of the mark from a difficult angle. Seven minutes before the break, Eastleigh had a Smith corner turned away off the far post by a well-placed defender only for the ball to come back out to Taggart who was brought down. Referee Tim Robinson deemed the challenge on the former Hawks winger to be fair to quash any penalty shouts from the home side and the Eastleigh bench. As the half came to a close there was to be no shortage of attacking threat from either side. In the 44th minute a Poate cross saw Taggart loop a header back into the danger zone at the far post where Gillespie attempted an acrobatic volley with his back to goal; a shot that was very unlucky to have whistled just over the cross bar. The last of the first half action saw yet another long throw from the visitors worked towards Dundas who turned Jordan before thumping a ferocious left-foot strike from 8 yards which crashed against the outside of the post. After the break both Eastleigh and Hampton & Richmond set out in the same manner - looking for that elusive first goal. Craig Dundas made his presence felt for the visitors as he used his upper body strength to power his way past Tom Jordan and into the penalty area to bear down on goal. Debutant Cook made a vital last ditch tackle at the crucial moment to prevent any further progress. Eastleigh’s Richard Gillespie continued to work the Beavers’ back line at every opportunity keeping them occupied along side Andy Forbes who made his second successive start tonight having made a recovery from injury. Ian Baird had a second penalty claim rejected as Forbes appeared to be caught by the on-rushing Lovett in an aerial challenge in the 52nd minute. On the hour, Jamie Brown was back in action for the first time in around two months having battled his way back to fitness as he replaced the unfortunate Gillespie. Brown for all of his endeavour and effort on a very welcome return, just lacked that little bit of match sharpness as it proved with the clear-cut chances he went on to squander later in the half. His first opportunity came about following a Taggart cross that was brought down by Forbes around six yards from goal. Brown lunged in to take over but scooped a shot high over the cross bar failing to trouble Matt Lovett by some distance. Two minutes later, excellent interplay from Taggart and Riviere resulted in the ball being worked into the feet of Brown. The strong target-man, hit an air shot which proved to wrong foot and fool his marker into diving out of the way. Without the added pressure of a challenge in sight at the second attempt, Brown steadied himself for another try but blazed wildly over when the amount of time and space allowed was crying out for a shot to hit the target as a minimum. 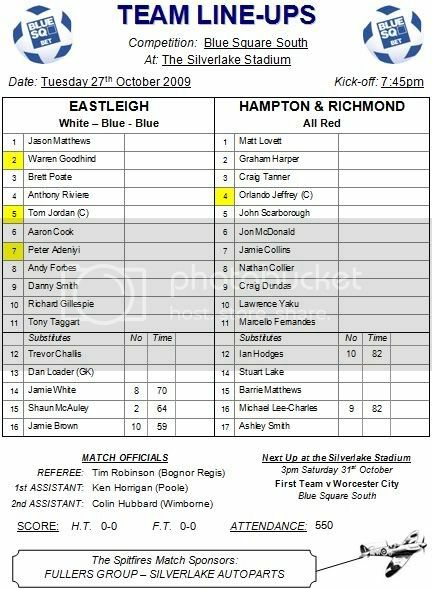 Shaun McAuley was brought on to face his former side, having played a major role in Hampton & Richmond’s successful campaign last season which ended in playoff heartache, just as Eastleigh’s year did. The fleet-footed wide midfielder was sent on in place of Warren Goodhind, soon to be followed by Baird’s last throw of the dice that saw Jamie White sent on in place of Forbes. The fresh legs and impetus of White almost reaped instant benefits as the young Southampton loanee’s first touches were to bring the ball down on his chest, swivel and hit a shot on the turn to force a save out of Lovett who dived low to his right to keep the ball out at his near post. From one end to the other in the blink of an eye, Hampton & Richmond opted for route one from the keeper to play Yaku in behind the defence who fired harmlessly wide of goal. 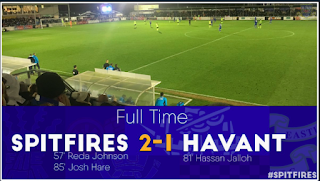 In the 76th minute, a Brett Poate corner was headed goal wards by Tom Jordan but as the effort was blocked the ball fell to the feet of Riviere who was unable to keep his shot down as another opportunity passed on by. Ten minutes from time, Lawrence Yaku pulled the trigger with his left foot having evaded a challenge from Jordan and must have thought he had done enough this time to beat the keeper. Fortunately for Eastleigh, Matthews was equal to the attempt as he instinctively pulled off a great reaction save to keep his clean sheet in tact. 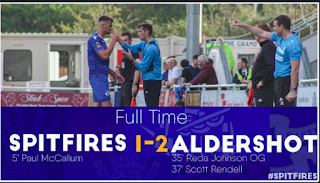 Alan Devonshire made a double substitution late on, in one last bid to get a goal, but it was Eastleigh who had the final chance of the evening. It was one to forget for Jamie Brown as Riviere’s cross from the right was inch perfect to pave the way for what should have been a simple nodded goal from two yards into an empty net. What actually happened didn’t quite go according to plan as the robust striker somehow managed to head the ball over with the goal gaping and at his mercy. With just three minutes remaining this would have been the ideal chance to grab the winner and seal all three points, though the chance came and went. Perhaps it wasn’t to be for Eastleigh on the night, and a draw in reflection was probably a fair result. As a positive, Cook’s debut was capped with a clean sheet.